It all starts with the soil! A soil in balance is literally teeming with microscopic life and will support plants that are strong, healthy and thriving. Soils that are compacted or compromised by past uses CAN be restored! And how we treat our soil impacts the global climate. In our work, we actively build soil carbon and reduce the atmospheric content of CO2. The soil will absorb water like a sponge, store carbon, and support a thriving landscape. At Pumpkin Brook, we begin with a soil test to get a base line reading for your property. All soil samples are tested by Logan Labs, LLC. We test for nutrient density and essential mineral balance. 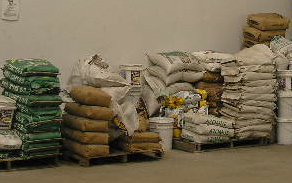 Most New England soils are deficient in Calcium and Potassium. Yet they are high in Iron and Aluminum and often in Phosphorus. Granular amendments are applied to remediate the soil on an as needed basis. Mixed with a high fungal compost, this becomes an attractive food for soil microbes and will stimulate the release of key nutrients and micronutrients. In an organic program, when we are building a soil to its full potential, this process is realized over a period of years. All our organic amendments are slow releasing. Thus we retest the soil annually or semi-annually to get a reading on how the soil balance is coming along. Both tests, the Essential Mineral Balance and the Soil Biology Test are done in late fall, just as the microorganisms are beginning to wrap up their “work” for the season. Fall is also the ideal time to amend soil, since the roots of woody plants are still actively growing. Buds for the following season are set at this time and will be supported by the new amendments. Raised bed or in-ground vegetable gardens can be amended in fall, after harvest, to build nutrient density in the soil for next year’s crops. Our compost tea program is an enhancement to the granular amendment soil building process. Compost tea injects microbial life and improves the soil’s ability to sustain it. Such soils (and the plants growing in them) are often most resistant to pests and diseases, have enhanced blooms, and greater tolerance to stress. We follow the Northeast Organic Farming (NOFA) Organic Land Care Standards when developing your soil amending program.